Very much a 'Cottage Industry', these hardtops are made to order - laminated by hand in small numbers by a 'bloke in a shed' for like-minded enthusiasts who'd like one for their own car. It's definately not the sort of thing that can be produced quickly or in large numbers so you'll never see me on Dragons Den with it, or find them being churned out and flogged on eBay. This makes a Chimaera with a hardtop unique, and can make the car look very special indeed, as well as benefiting from improved security, weather protection, and refinement. Of course there are a couple of compromises to be made - luggage space is reduced when both panels are stowed (but not as much as you might think) and the painted versions do need care and common sense when handling and storing them in the boot. It's also worth noting that this isn't a permanent conversion - it's very easy to revert back to the folding soft top if desired, for example if touring and needing the full boot capacity for luggage, giving the owner the option of both hard, and soft tops. In cases where the owner wants the option of refitting the folding roof then the Velcro would be left in place on the rear wing tops and the rear deck trimmed around it. This is the only visible difference. As much information as possible is provided below to allow owners to decide if the hardtop option is something they might want to consider further. Very valuable experience has been gained from installing these hardtops on a range of customers cars since 2009. The main point to note is that all Chimaera's vary due to their hand-built nature, and this means each hardtop needs tweaking and tailoring slightly differently for each car. It's highly unlikely that two hardtops are identical, and the time needed to fit one can vary a little from car to car. Minor on-going refinements and improvements have been made where possible which has led to a slightly different build process being incorporated into the new 'Malaysian Hardtop' (more on this later) which makes the hardtop a lot easier to DIY install, in fact the Malaysian hardtop has been specifically designed with DIY fitting in mind, and as a result should be easilly do-able for anyone with basic skills and a common sense approach. 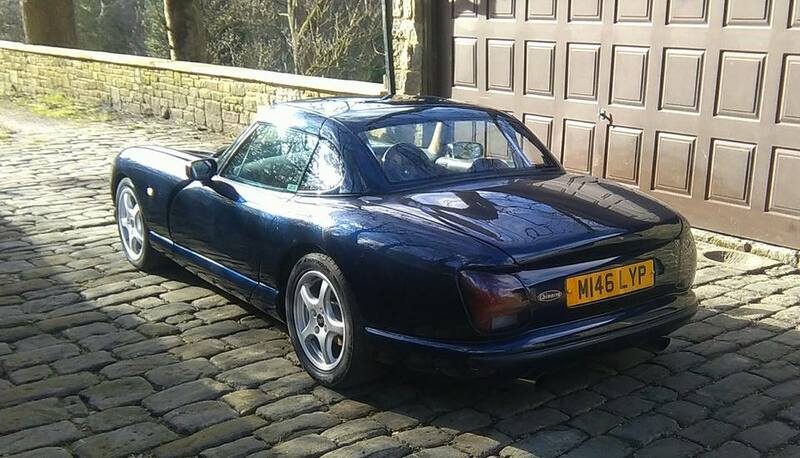 This article about hardtops wouldn't be complete without giving due credit to all previous hardtop customers who, in the true spirit of TVR, were effectively unpaid test drivers and a valuable part of the testing process. All of these TVR projects (which also includes the faired-in headlight covers) started out as experimental one-off's, and it is only with valuable feedback from the online TVR community that helps bring them to life and have wider appeal to other owners. Despite the modest production run and bespoke nature, replacement parts are available without excessive cost or having to buy a full kit. There's no need to worry about the unavailability of individual items or needing a tub of Vaseline for the bill - all parts can be supplied individually if necessary - anything from the catches (which are standard off-the-shelf parts from Protex) and other hardware, to replacement fibreglass panels and Perspex windows which are hand made rather than outsourced. The original version of the Chimaera hardtop was developed around 2008 and offered as a replacement to the original TVR fold-down canvas roof. Designed as a two-piece structure rather than a full one-piece hardtop, this allows the car to be driven with the centre targa panel removed individually, or as a full convertible with both panels detached. The two-part split design means that the panels are a lot easier and lighter to handle than a cumbersome one-piece hardtop and both sections fit into the Chimaera's large boot. The gallery pictures below show how the shape replicates the original soft top, and when the hardtop sections are covered in canvas (as shown on the silver/black car below) it is virtually indistinguishable from the original TVR folding roof, even the thermoformed 4mm Acrylic rear window is exactly shaped and curved to replicate the original soft top window. Painting the panels to match the car creates a completely different look as shown. The idea with this original version was not to stray from the classic Chimaera shape, but to improve on the original design by increasing security and weather protection over the original fold-down version - which as many owners have found can become tatty and frayed, as well as the stitching failing and allowing the rear window to become detached from the canvas in extreme cases. More recently, a second version of the hardtop has been developed and nicknamed the 'Malaysian Hardtop' due to it being a replica of a racing hardtop that TVR used during the Sepang 12hr race series around 2001. This racing hardtop was a basic one-piece structure which looked great, but wouldn't have been much use on a road car as it wasn't properly sealed to the bodywork or intended to be fully weatherproof (the black gaffer tape along the lower edge of the rear window on the red car below highlights this). To overcome any impracticalities of a single-piece hardtop and make the whole thing easier to handle, this new Malaysian Hardtop is also a two-piece design just like the previous version of the hardtop and both panels can be stowed in the Chimaera's generous boot. There's also another advantage having a two-part split design - it is widely known that the structure of a convertible car isn't quite as stiff as a coupe equivalent and as a result the chassis and bodyshell is affected more by torsional forces - normally noticed as scuttle-shake as the car travels. Even high-end monocoque convertibles are affected to some degree - I found this with our old Mercedes SLK and rattles and creaks could often be heard over undulating surfaces. On a Chimaera, these slight torsional forces mean the front bulkhead and windscreen are twisting differently to the rear body tub, so if a full single-piece hardtop were fitted it would be subjected to opposing twisting forces which, although relatively minor, over time may surface as hairline stress cracking at the mid point - which luckily is precisely where the two-part version joins together and allows any transferred body movement to dissipate harmlessly. The biggest challenge throughout this particular project was to try and recreate an authentic version of the above racing hardtop from a handful of low-resolution pictures dowloaded from the internet and printed off A4 size. No physical hardtop was available to reverse-engineer or take dimensions from - the whole thing was copied visually and a mock-up sculptured from filler before taking a mould. The stowing method is shown below for Chimaera's up until around 1999. Later cars have a different shaped boot aperture (slightly narrower to accomodate the later hinge arrangement) and as a result has a slightly different stowing method). In-keeping with the TVR original roof design, the Chimaera can still be used with the rear hardtop section attached to the car and the targa panel removed as shown below. The main centre targa panel is just like the TVR original part and fits in exactly the same way by locating underneath the top edge of the windscreen. The rear hardtop engages up to the targa panel using the same interlocking 'tongue and groove' idea. 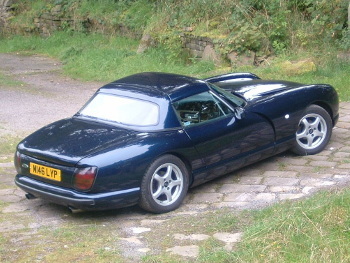 In this respect the two-part hardtop is no different from the original TVR folding roof set-up. The rear hardtop section is then secured in place on the rear deck by four over-centre Protex catches - one on each 'C pillar at each side of the rear window, and one on each 'B' pillar. The 'B' pillar catches also have a safety lock to prevent accidental unlatching. The existing TVR folding aluminium roof struts are carried over and are used to provide forwards pressure to the targa panel and ensure everything is seated properly up to the windscreen - just as with the original folding roof, except instead of being permanenty bolted to the underside of the roof the 'feet' of the struts locate into a pair of custom-fabricated stainless steel slide-in mountings. This allows the struts to be quickly and easily disconnected from the underside of the roof and folded down into the rear parcel shelf area to allow the hardtop to be lifted away. Removing both hardtop panels improves the flowing lines of the car and leaves the rear deck with a clean level appearance and completely unobstructed rear visibility - as opposed to the original folded roof 'pram handle' jutting up at an angle, obscuring rearward vision, and creasing the folding hood window. With both versions of the hardtop, the folding soft top needs fully removing and a replacement rear deck finisher panel bolting in place inside the rear deck to provide the anchor points for the quick release catches. This panel gets trimmed in vinyl to match the door tops. Also, the spare wheel will need relocating from it's position inside the offside rear wing (on early cars) and located centrally in the boot and strapped to the fuel tank as on later cars. On early cars the original boot hinge design restricts the opening height of the boot lid and this can make stowing the panels trickier than on later models where the boot lid opens almost vertically. Owners of early cars are strongly urged to consider the boot hinge modification which allows much greater opening height. Regardless of whether a hardtop is being fitted or not, the modified boot hinge arrangement is something all owners of early cars may find beneficial to allow much easier access to the boot and for storing the standard targa roof panel. More info regarding this boot hinge modification can be found in the drop down menu. With the painted hardtops extra care will be needed when handling and storing to avoid scratching. It is recommended that all hardtops - both painted and canvas versions, are covered with soft covers when stowed in the boot to create a cushioned layer and prevent marking from other articles in the boot. It's a good idea to use the original TVR Targa bag if available. After a few months of use, as the hardtop beds in, it may be necessary to re-adjust the catches or strut mountings slightly by moving them on their elongated mounting slots. Plenty of built-in adjustment is provided for this. The Acrylic windows must NEVER be cleaned with any kind of alcoholic or solvent based cleaning agents as this may cause cloudiness, as well as the plastic to become brittle - resulting in hairline stress cracking, or complete failure in extreme cases. Only use warm soapy water with a small amount of liquid soap if necessary to wash the windows. Alternatively, panel wipe / degreaser used in paintshops may be used to remove some marks. Surface scratches can be easilly removed from the Acrylic windows by wet-flatting the area with p1500 followed by p2000 paper, and then machine polishing the surface using paintshop compound such as Farecla G3, followed by a fine liquid compound. This is exactly the same process as used on paintwork scratches and is ideal for use on the windows bringing them back to a glass-like shine. Precise details and specifications may change slightly over time as the evolution is on-going.